A feature-laden board that appeals to songwriters and performers who need good presets fast. Lightweight and generally easy to use. A large number of sounds onboard to suit most styles. DiGital recorder is a bonus high-quality composing tool. Lightweight feeling build. Unpredictable keyboard velocity. Weak Hammond organ sounds. There's a lot crammed in to the front-panel, with all available space taken up with the Juno's various controls and tools. We've slight concerns about the Juno's build quality; at this price point we expect more than a thin plastic box. The DiGital Recorder is a nice, and useful, bonus tool. Since the recent resurrection of the Juno line in 2005, Roland has been busy honing and updating the range to keep it fresh. The Gi is the latest addition to the seemingly ever-expanding Juno range. To quickly put things into context, the Juno-D was the first of the new digital Juno's followed by the Di. Then came the G (the D's bigger brother with more sounds and features) and now the Gi. After the release of Roland's step-in-the-right-direction Gaia earlier this year, we were hoping that the 'new Juno' would be a call-back to the brand's celebrated 6, 60 and 106 past. Perhaps a high-end version of the Gaia? Maybe with some analogue chorus to boot? Maybe next time. 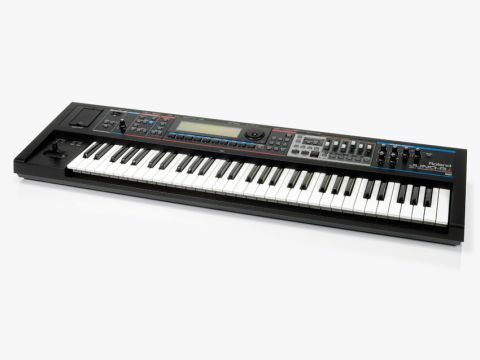 "We can see the Roland Gi getting a lot of love from cruise ship and hotel entertainers." So what's different about the G and the Gi? Well, quite a bit it. First off, the Gi has double the waveform ROM (128MB vs 64MB in the G, so there are plenty of new sounds onboard (over 1,300 in fact). Secondly, Roland have done away with the sequencing and sampling and instead added a powerful eight-track digital recorder which can record to high capacity SDHC cards for quick and easy access. On top of this, sounds are now called 'live sets' and allow stacking of up to four tones/layers and the option for battery power has also been added. Out of the box, we're still amazed by how light these Juno boards are. So light in fact, that it can easily be picked up with one hand. Obviously with this lack of mass comes our first concern - build quality. Overall, it's not bad but at a list price of £999 (street price £849) we were expecting something a little sturdier than a thin plastic case. In particular the sliders for the new digital recorder are too flimsy for our liking, though the dials and switchgear feel pretty solid. The keyboard is a five-octave affair (why no aftertouch?) but it's not the best action in the world being a bit too stiffly sprung which impedes its playability. Certainly some sounds that have velocity layers react a little unpredictably - we were really expecting something more responsive and expensive-feeling at this price point. Front-panel wise there's a lot crammed in with all available space used up. On the left is a door concealing the USB slot for a memory stick and from which you can also play MIDI files (SMF) or MP3/WAV/AIFF files for jamming along to. This is a handy feature particularly for solo performers (though the DiGital Recorder will not record to USB memory, only to the SDHC card/slot) though you could just take the Juno, a memory stick and microphone and perform a full-sounding gig on your own regardless. We can see the Gi getting a lot of love from cruise ship and hotel entertainers. We'll let you decide whether that's a good thing or not. Next is the D-Beam for air control of sounds, the volume control and then a section labelled keyboard that deals with MIDI control (this button puts the Gi in MIDI controller mode for controlling other MIDI equipment using the front panel switches, dials and sliders). Then there's a split button (the Gi can have a up to two sounds layered each side of a user definable split point), a tempo button for controlling tempo of the arpeggiator and recorder independently (or you can sync them together), plus octave up and down and transpose. Finally, there's the chord memory and arpeggiator section. Everyone loves an arpeggiator and despite their clichéd use in lots of Dance and Electronic Pop music, they can actually be great fun to play with for creating secondary rhythms during live shows, as well as to use in tracks. The arpeggiator onboard the Gi is pretty powerful and has several modes including up, down, up and down, random, note order (notes will sound in the order you press them) glissando (notes will glide between the highest and lowest notes pressed) chord (where all the notes you press sound simultaneously, great for chord riffs) plus auto and phrase modes too. You can also choose from preset and user arpeggio styles, each with several variations. Further parameters can also be edited including octave range, velocity, accent, shuffle (swing) rate and resolution (ninth note,16th note etc) and the arpeggiator can also be directed to only affect certain tones within a live set. The DiGital Recorder is a new feature unique to the Juno Gi. It's an eight-track recorder (with a further virtual eight tracks per channel totalling 64 tracks) and can hold a maximum number of 99 songs, while the maximum recording time for any one song is a total of 12 hours onto a 2GB SDHC card. The sound quality is excellent and records at 16-bit 44.1kHz. Simply plug into the line or mic/Hi-Z inputs and record. Up to two tracks can be recorded simultaneously, tracks can be bounced together to create more space and you can also record direct from the synth itself. Further to this, the recorder has its own dedicated rhythm track and you can add insert effects to the input and record them too, then master and export. The end result is a 16-bit WAV file and can be imported to your computer for burning to a CD, or for further editing. Editing is basic compared to a DAW but functions include punch in/out, bounce, copy/move tracks plus loop recording. The display is a large monochrome affair and does a fair job of cramming in lots of info but the Gi could have really done with a better-featured (colour?) screen, particularly when using the digital recorder and effects. Surrounding the display are several key buttons including 'menu' which takes you into the heart of the Gi's sounds and function editing, a preview button for auditioning sounds on the fly, a favourite function which allows quick selection of your most used/favourite sounds and under the display are 10 categorised sound selection buttons. Categories include rhythm set select (rhythm sets have a different rhythm sound per key) or live set select (1-9) which are split into piano, keyboard/organ/ bass, guitar/plucked, strings/orchestra, brass/wind, vocal/choir, synth/pad, FX/other categories for quick access to the 1,000+ sounds onboard. A live set is a sound comprising of up to four layers or tones and they are pretty straightforward to set up. There are three basic categories: Preset (which can't be edited) Special Live Sets (which are complex layered sounds that can comprise auto accompanying chords, arpeggios, rhythms and other sounds) and User, which is where you store all your edited sounds. In terms of editing sounds (live sets) there's plenty under the hood including, level/pan of layers, velocity response per layer, layer specific MIDI info mono/poly/legato/ portamento modes, amplifier pitch and filter envelopes, filter type edit (including three LPF types plus BPF and Peak Filter) and two LFO's syncable to internal and MIDI tempo. Effects-wise, there are 79 types available including the usual reverbs, delays, choruses and phasers and more unusual effects too, such as phone filters, step-ring-modulators, slicers, plus speaker simulators, enhancers, a decent vocoder (use with the rear mic input) and modelled distortions/amp models. There's a hell of a lot on board and they all sound very good, though some of the distortion effects sounded a bit harsh on certain presets, but a little digging into the settings provided much better results. Digging, though, is not exactly a live-performance trait you want to adopt. "It's not cheap and we have concerns about its gig-ready ruggedness, but the Gi is capable of great results." It's slightly annoying that there's no more than EQ, Reverb and filter controls on the front. A traditional amp envelope would certainly have been welcome. In fairness to the Gi, the presets themselves are generally very good and the new extra-large ROM means there's something for every purpose. Our favourites include some really excellent pianos and Rhodes (with some great authentic panning effects too) some lovely orchestral strings and woodwinds, very useable drum/percussion sounds, some great guitars and basses and synth pad/brass sounds too. The weakest sounds for us were the Hammond organ emulations which just don't feel or sound very authentic and there are only a handful of useable analogue synth leads too. Finally, the onboard filter is very capable and musical on the whole (though we did hear some very occasional stepping at high resonance settings) but overall the sound quality is excellent and the sound set very thorough, versatile and workhorse-like. If you need a motherload of useful, current and frequently impressive 'synth sounds' and need them 'quick and easy' then the Gi is ideal. For anyone who's interested in synthesis though the lack of true editing options will turn you off. In summary, the Gi is a powerful keyboard and that digital recorder that will suit stage performers, and singer songwriters alike, but it's basically a portable preset board with multi-track functions. It's not cheap and I have some minor concerns with its overall gig-ready ruggedness but the Gi is capable of great results all round if you put some time into learning how to get the most out of it.